Obsidian Entertainment have a pretty good track record for RPG’s – South Park: The Stick of Truth, Star Wars Knights of the Old Republic 2, Fallout: New Vegas to name just a few. 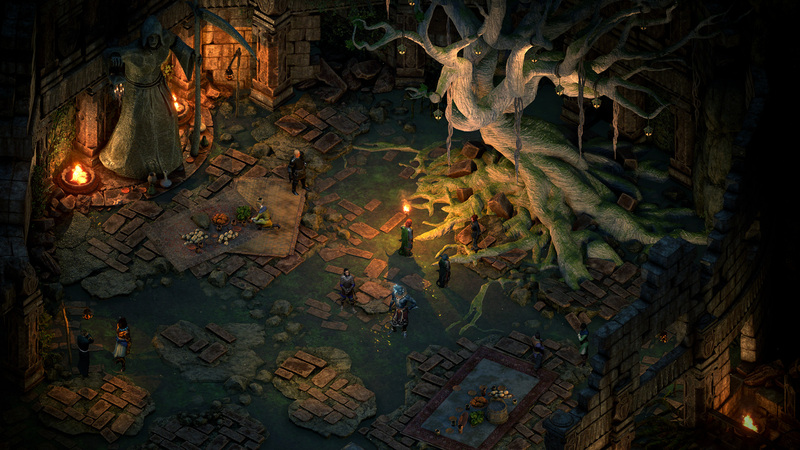 They’re back with a sequel to the popular Pillars of Eternity, with Pillars of Eternity 2: Deadfire. Unfortunately I never got around to playing the first Pillars of Eternity game, so I’m not exactly up to speed with the story and what has been going on up to the point where the sequel starts. Which meant that right from the off I was a little confused – I guess that was kind of to be expected. Some sequels don’t follow on directly from the first game, but Deadfire most definitely does. I wake in some kind of dream world/purgatory and get a second chance to go back to the world of the living to pursue this God who is literally (apparently) running across the lands of the Deadfire Archipelago – he’s also pretty massive too, you can see his footprints on the world map as you explore. So off I go embarking on a new fantasy adventure, but first things first is character creation. As you might expect, all your classic high fantasy tropes are here and I eventually settle on playing as a nimble wood elf with a penchant for stealing things and staying in the shadows. Customisation options are decent, and there is a massive screen of perks and upgrades available for all classes so you can tweak and tailor your player pretty much however you want. Our adventure doesn’t get off to the best of starts as our ship crashes on to some rocks and we wake up on a beach with your ship in tatters strewn across the sands. Time to track down the remaining crew and get back on the seas! This opening area is kind of your tutorial/introduction and quite frankly I felt like I needed it. As I made my way around the area and started clearing up the low level enemies I was getting a hang of things with the help of tutorial hints that were actually very helpful indeed. I mentioned before in one of our Geekly Reviews about some text being highlighted in conversations to provide you with some lore and background on certain things and it honestly was a god send and really helped me get up to speed with who was who etc… as there is a lot going on in Pillars of Eternity, lots of characters to meet, lots of Gods to get to know and you’ll want to know as much as possible about them all. Combat is handled via a turn based system and at the start can be fairly challenging as you get to understand the system – I’m sure veterans of the series will know what they’re doing though. Some attacks can only be performed a certain number of times during a fight, so making sure you use them at the right time is critical, you want to waste a big attack on some dweeb only for a big beast to emerge from the shadows seconds later. Early on I was getting thoroughly beaten in certain fights and would need to kite enemies quite a lot in order to survive. But slowly and surely I started to understand the strengths and weaknesses of my group and I was able to chain together interesting and devastating moves that I had learned from browsing through the large lists of abilities and perks for each party member as we all levelled up. There is a lot to see and do in the world of Pillars of Eternity, with each of the varied locations brought to life in the little details like the birds in the sky and the food on tables, they all feel unique and interesting to explore. Each corner of the map has something to do, something to see and something that will most likely distract you from your main goal, but that is in no way a bad thing. Going off to see what else you can do is part of the fun! One interesting addition to the game and something that I haven’t seen in other RPG’s is the ship you get to sail around. Firstly it’s a great way to get around and see the ‘sights’, but it also needs to be manned and you can hire crew mates at local taverns each with the own skills that they can bring to the crew and the more they sail the better they will get. As you might expect with such an emphasis on using your ship to sail around and explore, there are also pirates and other vessels to be wary of. But ship combat isn’t handled in some kind of RTS battle; it’s actually done through a beautifully presented story book, where encounters are read out to you with accompanying images. From here you can select options for how you want to handle the situations. This story book mechanic is actually used in a few places over the course of the game – meeting strangers on roads, conversing with gods and the aforementioned combat and it’s a lovely system that breaks up the gameplay and presents the game to you in a completely different and unique way. It was something that I really enjoyed as the game went on. The main story should keep you busy for a good 30-40 hours with side quests and other bits and bobs adding another 20 hours of gameplay on top. 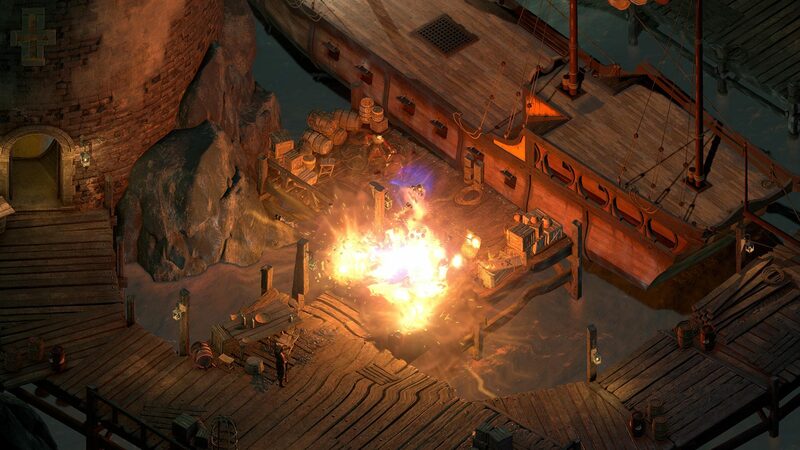 Pillars of Eternity 2: Deadfire is an interesting and enjoyable romp, packed full of interesting characters to meet, wonderful locations to visit and explore and a seas depth of RPG goodness to dive in to! I didn’t find the story to be anything ground breaking or heart wrenching, I never felt that attached to the characters in the game, but it was still enjoyable and engaging enough to stay interesting. My advice would be to go and play the first game beforehand though, not only will it help you with not feeling like you’ve been thrown in at the deep end, but you also have the option to transfer over your choices from the first game to this one, which is a mechanic I always like to see in RPG games where decisions you make can have an impact on the story.